The Library of Parliament is the main information repository and research resource for the Parliament of Canada. The main branch of the library sits at the rear of the Centre Block, on Parliament Hill, in Ottawa, Ontario, and is the last untouched part of that larger building's original incarnation, after it burned down in 1916. The library has been augmented and renovated a number of times since its construction in 1876, the last between 2002 and 2006, though the form and decor remain essentially authentic. The building today serves as a Canadian icon, and appears on the obverse of the Canadian ten-dollar bill. Designed by Thomas Fuller and Chilion Jones, and inspired by the British Museum Reading Room, the building is formed as a chapter house, separated from the main body of the Centre Block by a corridor; this arrangement, as well as many other details of the design, was reached with the input of the then parliamentary librarian, Alpheus Todd. The walls, supported by a ring of 16 flying buttresses, are load bearing, double-wythe masonry, consisting of a hydraulic lime rubble fill core between an interior layer of finished stone and rustic Nepean sandstone on the exterior. 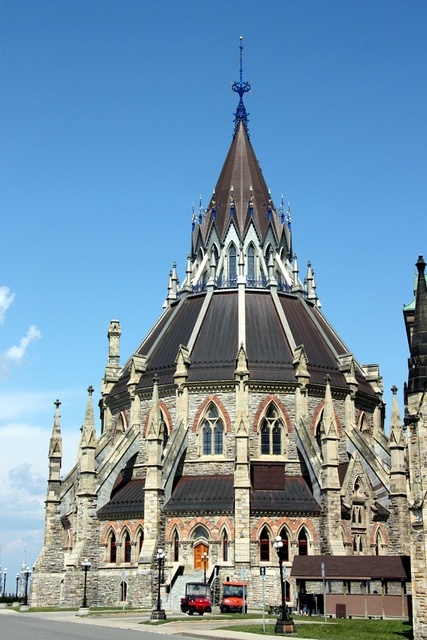 Around the windows and along other edges is dressed stone trim, along with a multitude of stone carvings, including floral patterns and friezes, keeping with the Victorian High Gothic style of the rest of the parliamentary complex. The roof, set in three tiers topped by a cupola, was originally a timber frame structure covered with slate tiles, but is presently built of steel framing and deck covered with copper. The initial overall combination of colours—grey Gloucester limestone and grey Nepean, red Potsdam, and buff Ohio sandstones, as well as purple and green slate banding—conformed to the picturesque style known as structural polychromy.